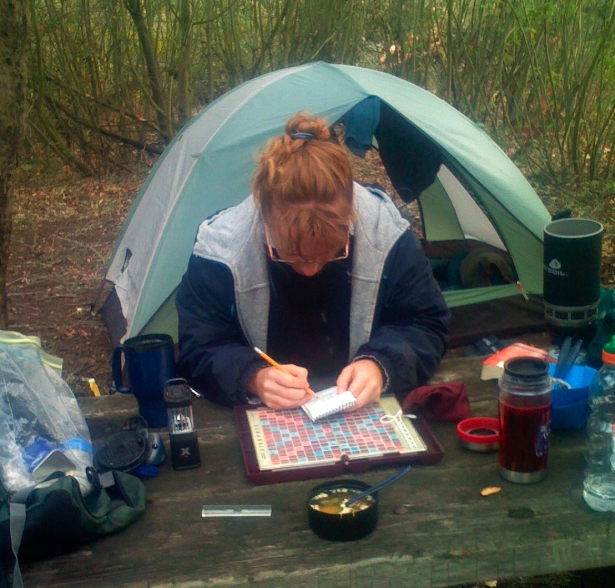 Liz and I just got back from an overnight backpacking trip in the local mountains. We had a new tent and other gear we wanted to test-drive, and didn’t want to be too stuck if some of it didn’t work. 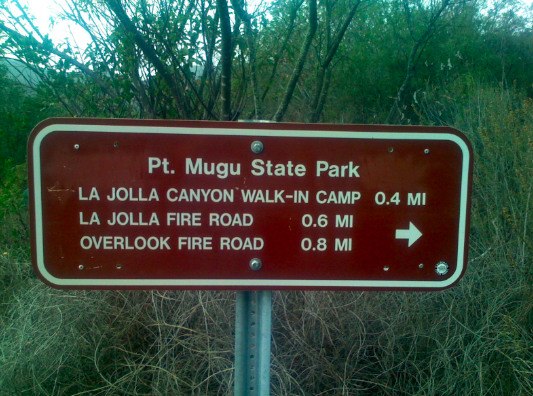 With this in mind, we chose the La Jolla Valley campground, since the trailhead’s less than an hour from our house, and it’s only a 2.5 mile hike in. As I mentioned in a previous post, this campground is the only one I know of in the Santa Monicas that doesn’t require reservations, and it’s rare to see anybody using it, so we felt pretty confident we would get a spot. The recent wildfires to the east probably kept people away too. We’d checked the weather and the red-flag status before-hand, along with asking a friendly wildland firefighter friend, and it looked like there was no danger. We stopped by the booth at Thornhill Broome Beach when we arrived, paid $3 per-person to camp and picked up a parking pass. We then drove across the street to the day-use parking lot, where the trail starts. There’s two trails leading off the lot, the Ray Miller section of the Backbone, and La Jolla Canyon trail. To get to the campground, we had to hike 2.5 miles up the La Jolla trail, which is the one behind the yellow gate, that starts off like a fire-road. You start off with a moderate uphill grade going along the canyon floor. After about half a mile you cross over the wash, and start heading towards a waterfall. Sadly, with the drought, there was no water left when we got there, but it’s still a nice spot to catch your breath. The trail heads up the side of the waterfall, and then starts switchbacking up the canyon wall. The next half-mile is probably the toughest part of the hike, with poor footing and some steep grades. At around 1.2 miles, you’ll reach a fork in the trail. Keep to the right/eastern side at this fork to get to the campground. The left/western trail heads towards Mugu peak, and connects with some of the other trails criss-crossing the valley to form some fun loops. It’s hard to tell from the sign, but you actually want to head left/west for the quickest route to the campground. It’s a short connector that skirts a pond, and the first camping spots are just off to the west of it. 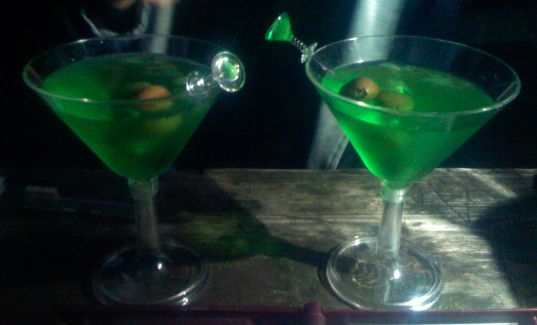 We didn’t investigate these, we knew there were some more further on, and the way to them looked a bit rough. The trail reaches a fire-road, and there’s camp spots just off this road, a short distance west. There’s no map of the camping spots, so you’ll just need to look for the numbered signs and explore. We went to site 5, which was secluded, in a small oak grove. There’s no camp-fires or water, but they do have a pit-toilet nearby, and gas-stoves are allowed. Slightly further west along the fire-road is a group camp site, that looks like it could handle up to ten tents comfortably. We did notice the restroom had been knocked off its foundation by a fallen tree, so you’ll need to use the toilet that’s near the individual sites instead. It was a pretty gruelling hike, we’d brought too much water, and there’s about 600 feet of elevation gain, so we were very happy to sit down at the picnic table and rest our feet. It was actually raining for once, so we got our new tent up as quickly as we could, to keep our stuff dry. I’m very happy with the REI Half Dome tent we got to replace our heavier car-camping one. It was only $99 on sale, but it weighs less than 5 pounds, was easy to put up and kept us dry, which is pretty much all I could ask for. I saved money on the tent, but more than made up for it with the stove. I fell for the Jetboil a few weeks ago when a friend showed me his on Santa Cruz, and it was so worth it’s $130 price tag. Very light and compact, it heats water up incredibly fast and efficiently, has electric ignition, and is almost immune to wind. During the night we were serenaded by coyotes, some very close, and there were smaller varmints snuffling in the nearby bushes. There was nobody else camping in La Jolla, so it was a bit spooky to be the only people for miles, especially with a full-moon a few nights before Halloween, but we both slept well. Funhouse Photo User Count: 1.954 total, 77 active. Still slowly but steadily growing. Event Connector User Count: 88 total, 1 active. I haven’t been focusing on selling this idea to any organizers for the last week, and it needs some time and effort to persuade promoters to consider it. I’m going camping with some friends soon and I had some questions about the campsite you used. Do you stop at the state park 2 miles South down the highway from the trailhead to get the camp pass? Also is the parking free to use and are you allowed to leave your car there overnight?